Following most excellent Top Ten submissions from Starbar, Polly Pocket, Dr Roddy, Barry-Sean and Mr Popper come MM’s top ten covers of 2010. Now, we’ve said on many occasions that we’re not great lovers of covers. However, some of the cover versions we heard in 2010 may well have done enough to change our minds permanently. And an honourable mention for this 2009 cover that we only first heard this year. And finally, we don’t post remixes because by and large we can’t be bothered with them. This was one exception to prove our rule. The Mystery Jets given the classic spacerock treatment by The Wooden Shjips. Here is the best of our November posts, a perfect mix tape to kick off the festive seasons and a nice reminder before we all get immersed in all those end-of-year top tens/twenties/fifties etc. And as always a couple of new ones too. Twenty five great tracks. Enjoy. Pristine nugget of 60s inspired garage rock, twangy rough-cut harmonies, a perfect hook and wall of sound noise. Chiming guitars, hypnotic percussion and spaced out vocals. Unhurried, thoughtful, raggedy old country soul. Brilliantly discordant, energetic rock ‘n’ roll blast. Chamber folk gem that ebbs and flows beautifully. Knocks the spots off most post-punk / garage rock we’ve heard this year. Excellent version of the Low Anthem classic. Chiming guitar, frantic drumming, great vocals. Well crafted, intelligent indie pop with swaggering attitude and studied nonchalance. An insistent low-key refrain overlaid with lyrics as good, and as dark, as any we’ve heard in 2010. Hypnotic, wistful and otherwordly. Freak-folk at its finest. Fingerpicked guitar and sparse percussion soundtrack searingly honest and sometimes uncomfortable folk tale. High octane garage rock ‘n’ roll. Warm, inviting and a little bittersweet folk. Classic Neil Young given a gossamer coating and let loose on the wind – a swirling, hazy gem. Sleazy, grimy, fuzzed up delight – so cool it could wear sunglasses indoors. Dark, pummelling tribal noise with a repetitive intro riff, rumbling drums and sonic interference. Foot stomping, anti-war folk protest song, like being in 1968. The gothic deep South combined with the rhythms of South America, barroom jazz and avant pop. Repetitive, melancholic guitar licks and strained poignant vocals. Understated and coolly elegant indie-pop. Our favourite track from the electro pysch-popsters album. And a couple of new ones. We love the ferocious garage jangle of the Jacuzzi Boys and their new single Coral Girls, while the Secret Sisters offer a lovely blend of traditional and timeless harmonious country heartbreak. Longtime MM fave Emily Reo dropped us a line to update us with some news and to give us this rather wonderful cover of Neil Young’s classic On The Beach. First up, The Fmly added both her full length album, Minha Gatinha, and EP, Witch Mtn, to their Fmly Rcrds digital downloads, and you can get everything (plus a few hidden surprises!) for free here! With the free downloads, they have also included this alluring and singularly original cover of On The Beach (and in time to honour his birthday too). It is as if she has taken the song and twirled it in the finest gossamer before letting it loose to float on the wind. It’s a swirling, hazy gem. Finally, if you want to check out more from Fmly Rcrds, here’s a link to the full list of digital downloads including New Alaskas, Dark Sea of Awareness, Professor Calculus, Truman Peyote, etc! We don’t usually do themed mixes, but Halloween is different. So many great songs lend themselves to a night of ghoulish wrongdoing and sorcery. So to get you in the mood, download a marvellous combination of folk, punk, psych-rock, paisley jangle, experimental, indie, and straight up rock ‘n’ roll. Fifteen great songs, all treats and no tricks. We were delighted this morning to find an e-mail from Emily Reo in our in-box. She is one of our very favourite experimental/ambient/darkpop songstresses, and had dropped us a line to send us a brand new collaboration with the highly regarded Blackbird Blackbird. It was a combination to whet the appetite: sampling her unique vocal style and phrasing and then looping it firmly over spectacular icy beats and synths, the song still retains a sticky, sweet heartbeat that pulses with melody and will have you pressing the repeat button as soon as its over. It is retro enough to be cool, contemporary enough to keep the buzz going, but above all it is good enough to still be on your playlist in 12 months time. Visit Blackbird Blackbird’s MySpace here. Visit Emily Reo’s MySpace here. Here is our usual round-up of the best songs we’ve posted in August together with a couple of our favourite covers and three new songs to tempt you. Another perfect mix tape we think. And three excellent new tracks to finish off with: firstly another cover – The Drums doing Arcade Fire, the new taster track from indie-folk God Sufjan Stevens and finally some superb, caustic, drone punk from The Band In Heaven. We have featured the wonderful Emily Reo a few times on MM and it is always a pleasure to get something new from her in our in-box. And so it was today when we received this track called Turn Into Feathers. It is a collaboration with Truman Peyote and will feature on his forthcoming split release with Attached Hands on Post Records. Starting like something from a banned 1970s horror flick it quickly transforms with some Kate Bush type vocals into a delightfully skewed three minute pop song for freaks and outsiders, treading a line somewhere between Aphex Twin and MGMT. Marvellous! Visit Truman Peyote’s MySpace here. Visit Emily Reo’s MySpace here. 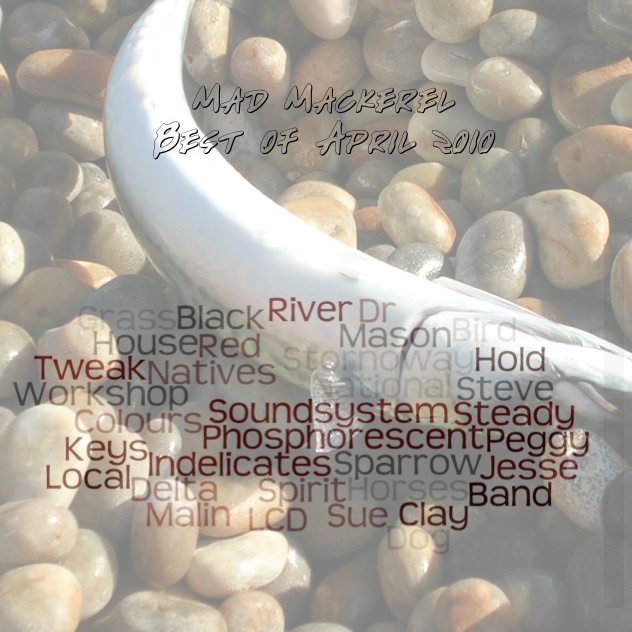 Here is our regular monthly round up of 25 of the best tracks posted on Mad Mackerel in the past month, and three new gems too. That’s a more than decent mixtape sorted even if we were crap in the World Cup! Mesmerising and hypnotic, with repetitive guitar riff and laconic vocals. Our discovery of the month! From the wonderful Buffetlibre/Amnesty Peace project (180 tracks for $5 minimum) comes this brilliant Ramones cover by MM faves Port O’Brien. Buy this compilation here now! As anyone who reads MM will know we are big fans of Emily Reo and have been eagerly awaiting the release of her EP Witch Mountain. The five track cassette is (of course) as dreamily seductive and captivating as we were hoping. There are fuzzy, distorted vocals, loops and washed out synths but always carried along by a lovely melody and the overall result is wonderful. Best of all, it also has a subversive side that provides more than just a hint of the unexpected and the intriguing feeling that maybe she is slyly laughing behind her hand at a joke no-one else gets – least of all you. Buy from Breakfast of Champs Records here.